This is by far one of the most popular RC Laser events in the country. Mary Lee and Rocky Cale used all the best resourses to this over the top regatta. Using past AMYA president Dave Brawner as the regatta RD sure helps to keep the regatta on the right course. The regatta started with fun practice racing on Friday and a skipper’s dinner at CJ’s. Saturday racing is for dividing the fleet into gold and silver fleets. There are always some surprises here! 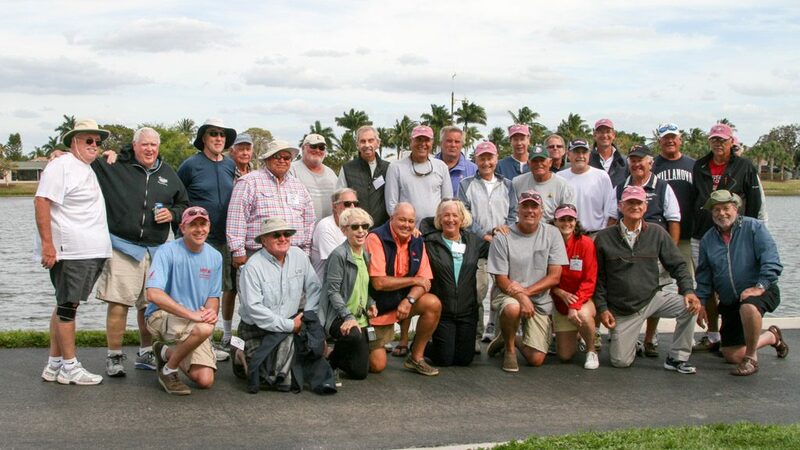 To top off Saturday’s seeding races the entire fleet, guests and race committee adjourned for dinner at the Marco Island Yacht Club where everyone enjoyed dinner and drinks. At the dinner George Domenech and Rocky Cale said a few words. This was also a chance to buy raffle tickets for Mary Lee’s supper raffle. Going into the fleet racing on Sunday, Jim Kaighin had a sizable lead in the Gold Fleet with Rob Seidelmann second and Fred DeSantis in third place. In the Silver fleet the leaders were Harry Henkel and Rick Hellyar tied for first, and Dorian Goldberg and Mike Campbell tied for third place. The heavy winds continued and the entire fleet was using C & D sails. At times there were 20 degree wind shifts between races that gave the race committee plenty to think about. Eight races were sailed by each fleet two at a time, giving the other fleet plenty of time to rest and make any necessary repairs. When it was over Jim Kaighin had won 6 of the Gold Fleet races giving him a 25 point difference ahead of Fred DeSantis with 44 points and a 29 point lead over third place Rob Seidelmann. The other two race winners of gold fleet were Frank Vella and Jim Flach. Silver Fleet first place went to Dorian Goldberg who finished the regatta with four straight first place finishes. Second place went to Terry Naylon followed by G. Harvey in third. This year’s awards were over the top, gorgeous crystal vases. Terry Naylon won the RC Laser raffle prize donated by Jim Meyers of Intensity Sails. After the awards and a quick clean up of the sailing site the skippers and friends headed south to Stan’s Idle Hour for fun and music.